The inspiring stories of Good Governance and Leaership in the phililippines Volume 1 is a Kaya Natin! Champions must-read book on how our country's leaders are practicing good governance. As it was proudly launch last friday July 29 at the Fully Book bookstore in Bonifacio Global City, Taguig. This is first installment of The Kaya Natin! Champions. Ten stories of "champions" for good governance who have embodied the values of effective and empowering leadership with integrity is the book compilation. Every chapter will tell you the story of one individual, from their background to their political career and their leadership lessons. 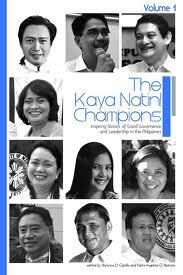 These former and incumbent officials are part of the roster of champions of the Kaya natin! Movement for Good Governncance and Ethical Leadership from the local government units. Among hailed champions featured in this book are Kaya Natin co-founderrs Jesse Robredo, Grace Padaca, and Ed Panlilo; former mayor Sonia Lorenzo of San Isidro, Nueva Ecija, Sen. Teofisto Guingona III, Rep. Teodoro Baguilat, Jr. from Lone District of Ifugao, Rep. Bolet Banal - 3rd District Q.C., former councilor Mabel Sunga-Acosta - 1st Diastrict of Davao City, Mayor Roque Verzosa, Jr. from Tagudin, Ilocos Sur and Board Member Shirlyn Macasarte from Midsayap, Cotabato. "The objective of this book is to highlight the positive and inspiring stories of political leaders who are doing good for the country, and how this can help bring about empowerment for ordinary Filipinos who also want to make a difference, "
This leadership book is not only targets those who are currently in the position, but also the youth, who will later succeed in governing the nation. To get he youth more involved in this movement, students and young professionals were trained in good governance writing workshops and then tasked to be biographers of the book. The Kaya Natin! Champions, inspiring stories of Good Governance and Leadership in the Philippines Volume 1 is only one of the few projects of Kaya Natin! movement and the second installment of the book, featuring another set of inspiring good leaders, is set to be worked out soon. Grab a copy of the Kaya Natin! Champions book now, available in Fully Booked nationwide. Be a Kaya Natin! advocate and spread the news on good governance. To volunteer, log on to www.kayanatin.org.